Today is International Coffee Day! People around the world are celebrating their love of coffee. Everyday is coffee day for me. I drink A LOT of coffee and my day isn’t complete without at least one or two cups. 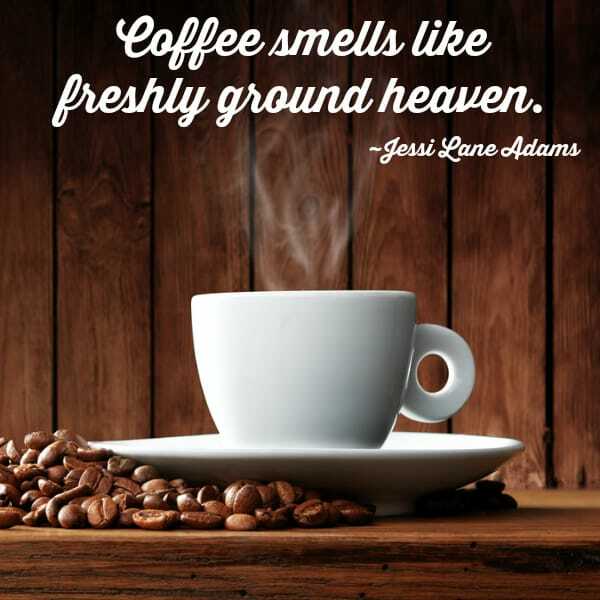 Actually, it’s more like three or four….even 9 pm is coffee time in my house! International Coffee Day is also a day to promote fair trade coffee and raise awareness for the plight of coffee growers around the globe. It was first celebrated in 1983 in Japan and the All Japan Coffee Association is responsible for its creation. I only started drinking coffee in my early 20s. My husband was a huge coffee lover and I would always ask for a sip of his coffee. Eventually, I just started making my own. Back then, I took it sweet with cream and sugar. About 10 years ago, I weaned myself off sugar and just put cream in my coffee. It took a little getting used to, but now I couldn’t imagine going back to my old ways! Over the next month, I’m participating in a special program along with four other Canadian bloggers who also share a love of coffee. 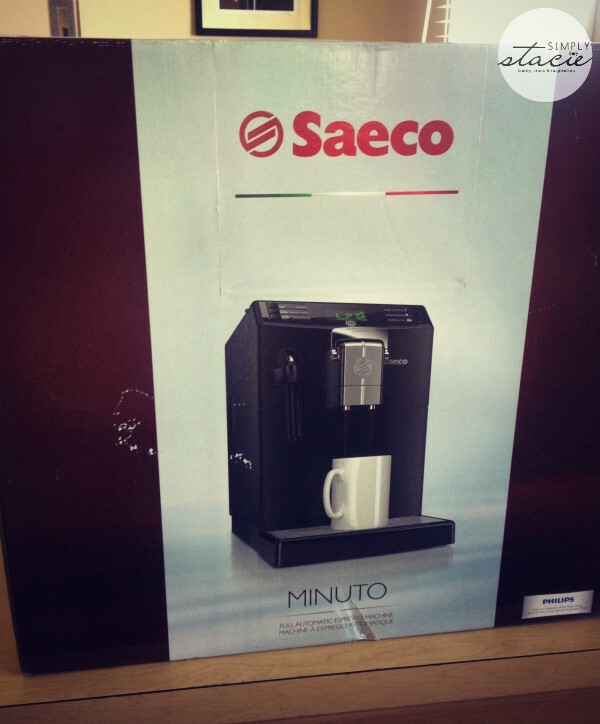 We are trying out the brand new Saeco Minuto Focus automatic espresso machine. What’s different about this machine is that it’s the very first fully-automatic, bean-to-cup coffee machine that allows you to make delicious Italian coffee and espresso with the flick of lever. Yes, you heard that right. 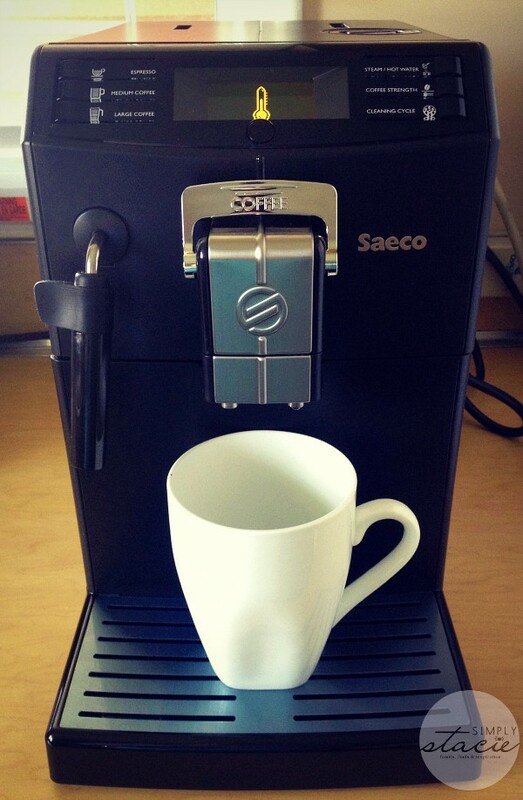 The Saeco Minuto Focus uses REAL coffee beans to brew an individual cup of coffee! It’s been years since I’ve bought coffee beans and normally it was for a typical coffee maker where you need to brew an entire pot. I have only had the machine a few days so I’m still learning about it and testing out all its bells and whistles. And let me just say that it does have lots of them! It’s all in the details. 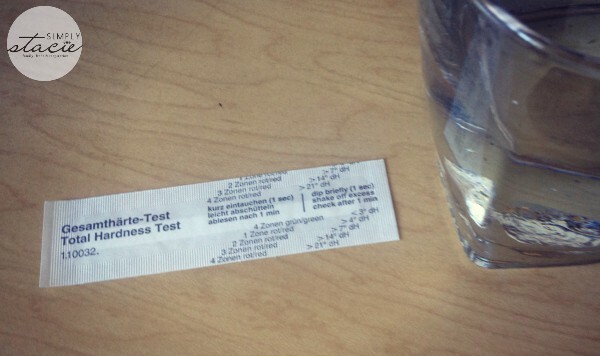 For instance, when I was unpackaging the box and setting it up, I noticed it included a Total Hardness Test strip to test how hard your water is. I was able to set the machine at the proper level based on my test results. I have soft water so mine was only at level one. If you have hard water in your home, you can set the machine to the highest level. 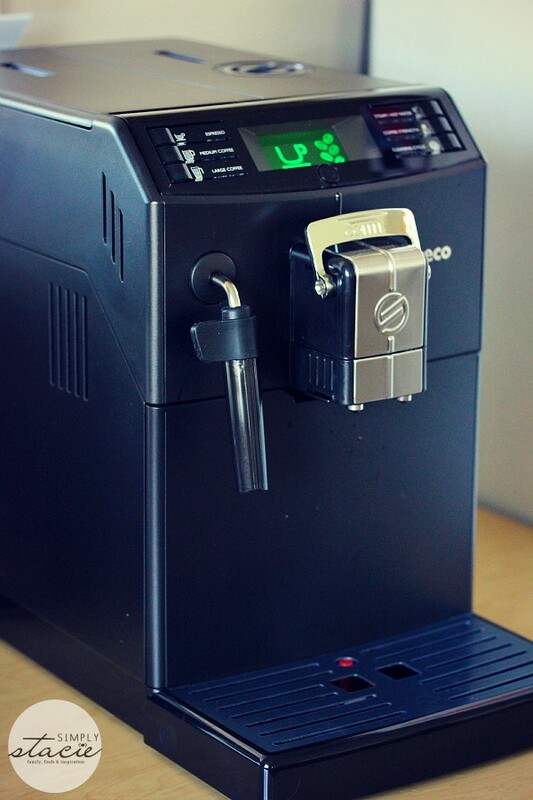 The Saeco Minuto Focus lets you customize your cup of coffee to suit your taste. The Memo function lets you easily adjust strength, temperature and length. It’s very intuitive to use and so don’t think that you need to keep the instruction manual on top of the machine to use it. I looked at it once during set up and have it tucked away in the cupboard. It’s super easy to make a perfect cup of coffee. It also has an adjustable 100% ceramic grinder to change up the coffee’s richness as some blends require different levels of granularity to release the full flavour. It has five settings from finest grind to coarse. So far I’ve only made coffee with it, but plan to try Espresso and use the Classic Milk Frother to make other types of beverages. The Classic Milk Frother is the handle featured on the left in the image below. 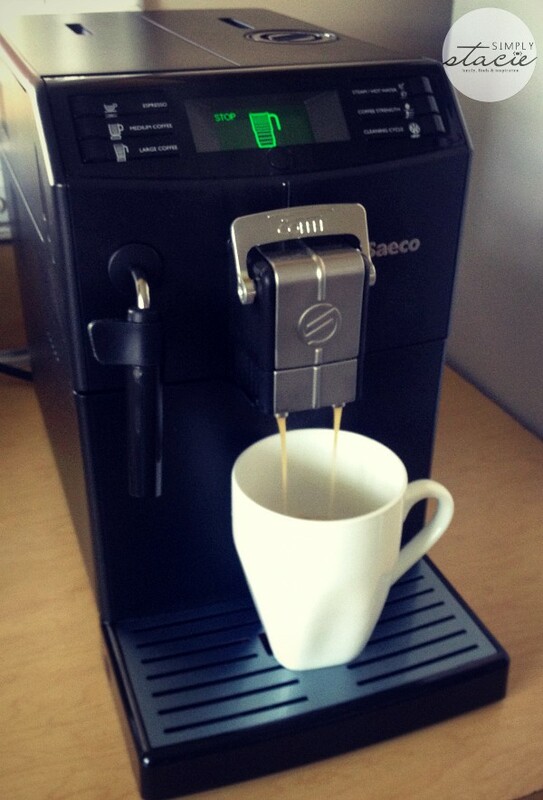 The Saeco Minuto Focus makes a good cup of coffee! It’s hot and fresh, just the way I like it. I look forward to the first sip of the morning to get my day started. I’ll be sharing more about the Saeco Minuto Focus in the coming weeks once I’ve had a chance to fully embrace all its features! On International Coffee Day, I raise my mug to my fellow java lovers! What’s in your mug today? This coffee machine is so awesome and it has a classic milk frother! What a nice addition to a coffee maker because most machines do not have this! I would love to own one of these! I think these “one” serving cups are such a great idea. My family all have a difference flavor, and this would allow everyone to be happy. Wow, that looks like the real deal! Happy Coffee day to all! Looks like a great machine. I love my coffee and enjoy trying new blends. Currently we get our fair trade coffee from Ten Thousand Villages. at our house we got a side by side coffee pot and that is on from time i get up til i go to bed in the weeeeeeeeeeee hours lol sometime it is on days on in lol this one is way cool. I can’t drink coffee after six PM if I want to sleep that night, but I can’t even imagine a day without my favourite beverage. This machine looks like the cat’s meow! Wow! Beans to coffee in and instant brewer! how exciting! I drank tea instead of coffee since I didn’t need the caffeine today. I would love to own a coffee machine like this one! 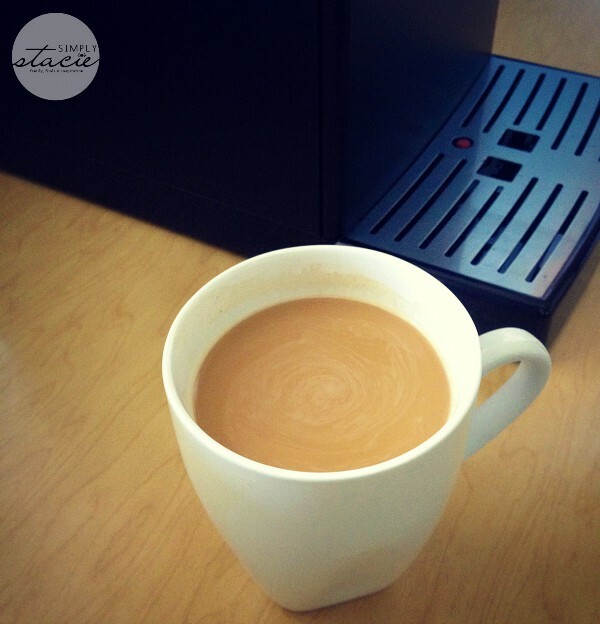 Coffee customization and rich taste…perfect for a coffee lover! My husband has to start each day with several cups of strong coffee. Stronger than most like…he likes it pretty much walking. 🙂 This would be great for us all to get it how we want it. Enjoy the day after coffee day. I’ve never heard of this brand but it looks like an awesome machine. I drink a lot of coffee and appreciate a machine that brews my java well. very nice but I could never afford to purchase one, I have my stove top making espresso kettle and that will just have to do. Looks like a great machine but it looks like it takes up a lot of counter space. What a clever machine, I hope the price drops so that we can all afford to buy one! I like the Saeco Minuto Focus, so fancy! I’d love to have one of these machines.